Messier 82 (also known as NGC 3034, Cigar Galaxy or M82) is a starburst galaxy approximately 12 million light-years away in the constellation Ursa Major. A member of the M81 Group, it is about five times more luminous than the whole Milky Way and has a center one hundred times more luminous than our galaxy's center. The starburst activity is thought to have been triggered by interaction with neighboring galaxy M81. As the closest starburst galaxy to Earth, M82 is the prototypical example of this galaxy type. SN 2014J, a type Ia supernova, was discovered in the galaxy on 21 January 2014. In 2014, in studying M82, scientists discovered the brightest pulsar yet known, designated M82 X-2. A mosaic image taken by the Hubble Telescope of Messier 82, combining exposures taken with four colored filters that capture starlight from visible and infrared wavelengths as well as the light from the glowing hydrogen filaments. Composite image – HST (vis); Spitzer (ir); Chandra (x-ray). Chandra X-ray observatory image of the galaxy. M82 was first discovered by Johann Elert Bode on December 31, 1774 together with M81; he described it as a "nebulous patch", about 0.75 deg away from M81, "very pale and of elongated shape". In 1779, Pierre Méchain independently rediscovered both galaxies and reported them to Charles Messier, who added them to his catalog. M82 was previously believed to be an irregular galaxy. In 2005, however, two symmetric spiral arms were discovered in near-infrared (NIR) images of M82. The arms were detected by subtracting an axisymmetric exponential disk from the NIR images. Even though the arms were detected in NIR images, they are bluer than the disk. The arms were previously missed due to M82's high disk surface brightness, the nearly edge-on view of this galaxy (~80°), and obscuration by a complex network of dusty filaments in its optical images. These arms emanate from the ends of the NIR bar and can be followed for the length of 3 disc scales. Assuming that the northern part of M82 is nearer to us, as most of the literature does, the observed sense of rotation implies trailing arms. In 2005, the Hubble Space Telescope revealed 197 young massive clusters in the starburst core. The average mass of these clusters is around 200,000 solar masses, hence the starburst core is a very energetic and high-density environment. Throughout the galaxy's center, young stars are being born 10 times faster than they are inside the entire Milky Way Galaxy. In the core of M82, the active starburst region spans a diameter of 500 pc. Four high surface brightness regions or clumps (designated A, C, D, and E) are detectable in this region at visible wavelengths. These clumps correspond to known sources at X-ray, infrared, and radio frequencies. Consequently, they are thought to be the least obscured starburst clusters from our vantage point. M82's unique bipolar outflow (or 'superwind') appears to be concentrated on clumps A and C and is fueled by energy released by supernovae within the clumps which occur at a rate of about one every ten years. The Chandra X-ray Observatory detected fluctuating X-ray emissions from a location approximately 600 light-years away from the center of M82. Astronomers have postulated that this fluctuating emission comes from the first known intermediate-mass black hole, of roughly 200 to 5000 solar masses. M82, like most galaxies, hosts a supermassive black hole at its center with a mass of approximately 3 x 107 solar masses as measured from stellar dynamics. In April 2010, radio astronomers working at the Jodrell Bank Observatory of the University of Manchester in the UK reported an object in M82 that had started sending out radio waves, and whose emission did not look like anything seen anywhere in the universe before. There have been several theories about the nature of this object, but currently no theory entirely fits the observed data. It has been suggested that the object could be an unusual "micro quasar", having very high radio luminosity yet low X-ray luminosity, and being fairly stable, it could be an analogue of the low X-ray luminosity galactic microquasar SS 433. However, all known microquasars produce large quantities of X-rays, whereas the object's X-ray flux is below the measurement threshold. The object is located at several arcseconds from the center of M82 which makes it unlikely to be associated with a supermassive black hole. It has an apparent superluminal motion of four times the speed of light relative to the galaxy center. Apparent superluminal motion is consistent with relativistic jets in massive black holes and does not indicate that the source itself is moving above lightspeed. M82 is being physically affected by its larger neighbor, the spiral M81. Tidal forces caused by gravity have deformed M82, a process that started about 100 million years ago. 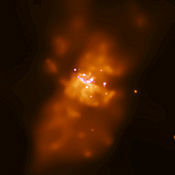 This interaction has caused star formation to increase tenfold compared to "normal" galaxies. M82 has undergone at least one tidal encounter with M81 resulting in a large amount of gas being funneled into the galaxy's core over the last 200 Myr. The most recent such encounter is thought to have happened around 2–5×108 years ago and resulted in a concentrated starburst together with a corresponding marked peak in the cluster age distribution. This starburst ran for up to ~50 Myr at a rate of ~10 M⊙ per year. Two subsequent starbursts followed, the last (~4–6 Myr ago) of which may have formed the core clusters, both super star clusters (SSCs) and their lighter counterparts. Stars in M82's disk seem to have been formed in a burst 500 million years ago, leaving its disk littered with hundreds of clusters with properties similar to globular clusters (but younger), and stopped 100 million years ago with no star formation taking place in this galaxy outside the central starburst and, at low levels since 1 billion years ago, on its halo. A suggestion to explain those features is that M82 was previously a low surface brightness galaxy where star formation was triggered due to interactions with its giant neighbor. ^ a b c d e f "NASA/IPAC Extragalactic Database". Results for NGC 3034. Retrieved 27 October 2006. ^ "M 82". SIMBAD. Centre de données astronomiques de Strasbourg. Retrieved 14 December 2018. ^ "M82 - Cigar Galaxy". astropixels.com. 26 March 2012. Retrieved 15 December 2018. ^ "Hubble views new supernova in Messier 82". ESA / HUBBLE. Retrieved 12 March 2014. ^ a b c d e f g h i j k l m Barker, S.; de Grijs, R.; Cerviño, M. (2008). "Star cluster versus field star formation in the nucleus of the prototype starburst galaxy M 82". Astronomy and Astrophysics. 484 (3): 711–720. arXiv:0804.1913. Bibcode:2008A&A...484..711B. doi:10.1051/0004-6361:200809653. ^ a b "ATel #5786: Classification of Supernova in M82 as a young, reddened Type Ia Supernova". ATel. Retrieved 14 April 2018. ^ a b "Sudden Supernova In M82 Galaxy Rips Apart The Night Sky (A Bit)". Huffington Post. ^ a b Plait, Phil (22 January 2014). "KABOOM! Nearby Galaxy M82 Hosts a New Supernova!". Retrieved 14 April 2018 – via Slate. ^ "Shockingly Bright Dead Star with a Pulse Is an X-ray Powerhouse". Space.com. 8 October 2014. ^ "Researchers detect brightest pulsar ever recorded". Massachusetts Institute of Technology. 8 October 2014. ^ "NASA's NuSTAR Telescope Discovers Shockingly Bright Dead Star". NASA. 8 October 2014. ^ Mayya, Y. D.; Carrasco, L.; Luna, A. (2005). "The Discovery of Spiral Arms in the Starburst Galaxy M82". Astrophysical Journal. 628 (1): L33–L36. arXiv:astro-ph/0506275. Bibcode:2005ApJ...628L..33M. doi:10.1086/432644. ^ Happy Sweet Sixteen, Hubble Telescope! Newswise, Retrieved 30 July 2008. ^ Patruno, A.; Portegies Zwart, S.; Dewi, J.; Hopman, C. (2006). "The ultraluminous X-ray source in M82: an intermediate-mass black hole with a giant companion". Monthly Notices of the Royal Astronomical Society: Letters. 370 (1): L6–L9. arXiv:astro-ph/0602230. Bibcode:2006MNRAS.370L...6P. doi:10.1111/j.1745-3933.2006.00176.x. ^ Gaffney, N. I.; Lester, D. F. & Telesco, C. M. (1993). "The stellar velocity dispersion in the nucleus of M82". Astrophysical Journal Letters. 407: L57–L60. Bibcode:1993ApJ...407L..57G. doi:10.1086/186805. ^ a b c "Mysterious radio waves emitted from nearby galaxy". Retrieved 14 April 2018. ^ a b Muxlow, T. W. B.; Beswick, R. J.; Garrington, S. T.; Pedlar, A.; Fenech, D. M.; Argo, M. K.; Van Eymeren, J.; Ward, M.; Zezas, A.; Brunthaler, A.; Rich, R. M.; Barlow, T. A.; Conrow, T.; Forster, K.; Friedman, P. G.; Martin, D. C.; Morrissey, P.; Neff, S. G.; Schiminovich, D.; Small, T.; Donas, J.; Heckman, T. M.; Lee, Y. -W.; Milliard, B.; Szalay, A. S.; Yi, S. (2010). "Discovery of an unusual new radio source in the star-forming galaxy M82: Faint supernova, supermassive black hole or an extragalactic microquasar?". Monthly Notices of the Royal Astronomical Society: Letters. 404 (1): L109–L113. arXiv:1003.0994v1. Bibcode:2010MNRAS.404L.109M. doi:10.1111/j.1745-3933.2010.00845.x. ^ O'Brien, Tim. "Mystery object in Starburst Galaxy M82 - Jodrell Bank Centre for Astrophysics". www.jb.man.ac.uk. Retrieved 14 April 2018. ^ Divakara Mayya, Y.; Carrasco, Luis (2009). "M82 as a Galaxy: Morphology and Stellar Content of the Disk and Halo". Revista Mexicana de Astronomía y Astrofísica, Serie de Conferencias. 37: 44–55. arXiv:0906.0757. Bibcode:2009arXiv0906.0757D. ^ Declination separation of 36′.87 and Right Ascension separation of 9′.5 gives via Pythagorean theorem a visual separation of 38′.07; Average distance of 11.65 Mly × sin(38′.07) = 130,000 ly visual separation. ^ Separation = sqrt(DM812 + DM822 – 2 DM81 DM82 Cos(38′.07)) assuming the error direction is about the same for both objects. ^ "Astronomy Now: Bright, young supernova outburst in Messier 82, MARK ARMSTRONG, 23 January 2014". Retrieved 14 April 2018. ^ "Supernova in M82 Passes Its Peak - Sky & Telescope". 17 February 2014. Retrieved 14 April 2018. 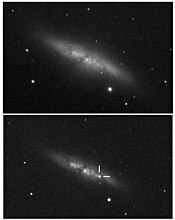 ^ "Supernova in Messier 82 discovered by UCL students". www.ucl.ac.uk. Retrieved 14 April 2018. Wikimedia Commons has media related to Messier 82.